Lieutenant Colonel Bart Hoeben, C4ISR / Section Head Air Command & Control at The Netherlands MoD latest speaker to join the 3rd Annual Network Centric Warfare. LONDON, LONDON, UNITED KINGDOM, November 30, 2018 /EINPresswire.com/ — In the run up to next year’s Network Centric Warfare conference, returning to Rome, Italy on 4th – 5th February 2019, SMi is delighted to announce the newest edition to the expert speaker line-up, which includes international government and high-ranking military speakers, as well as industry-leading organisations. Lieutenant Colonel Bart Hoeben, C4ISR / Section Head Air Command & Control, Ministry of Defence, The Netherlands, will be joining next year's conference, where he will be providing key updates on ‘“The Combat Cloud”: Facilitating Network Enabled Command and Control’. His presentation will focus on developing an effective network enabled ‘combat cloud’ to transform C2 in the air and land domains, how to incorporate multiple nodes into one cloud for greater sensing and effecting, ideas in effectively processing and disseminating real time data, as well as the challenges faced in developing a network enabled C2 cloud. Participants of the highly-anticipated event will have the exclusive opportunity of hearing the unique perspectives and experiences of Lieutenant Colonel Bart Hoeben at the conference in Rome. Delegates will also hear from an impressive international line-up of high-ranking military experts and industry leaders from Italy, Austria, NATO, EU Military Staff, Germany, Denmark, UK, Netherlands, Canada, Sweden, and more. The two-day event is set to explore in detail the importance of effective strategic integration of networked platforms, in order for military forces to harness network technology and gain an operational advantage. It will also bring together Network Centric Warfare planners, practitioners, and experts for invaluable insight and discussion of an increasingly important topic in the world of defence. 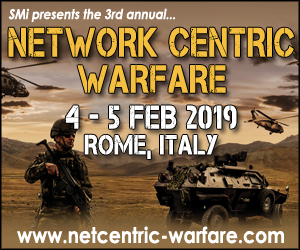 Download the event brochure on the website to view the agenda and full speaker line-up, and register your place at http://www.netcentric-warfare.com/einpr. Book your place before 14th December to save £100.